Photographs are offered in size editions of 9 or fewer and limited to a total edition of 36. Print sizes and editions of some photographs may vary, but they will not exceed 9 of any size, and total editions will not exceed 36. Each edition has a 3-tier, 3-print, structure. Prices increase as the remaining number of an edition decreases. The drop-down size menu of each photograph will display the numbers remaining in each edition. All photographs, regardless of size, are printed on aluminum panels. This relatively new medium renders rich and vivid color depth unrivaled by any paper of any kind. The images are not attached or adhered to the metal, but actually fused into it under intense heat and pressure. Prints 12x18 and larger are presented in a sleek, new, frame-less "Exhibit Mount" style. The panels on which the photographs are printed have a white background, and the finished prints are given a mid-gloss coating. This produces the crispness of a traditional gloss with reduced glare, and also provides UV protection. 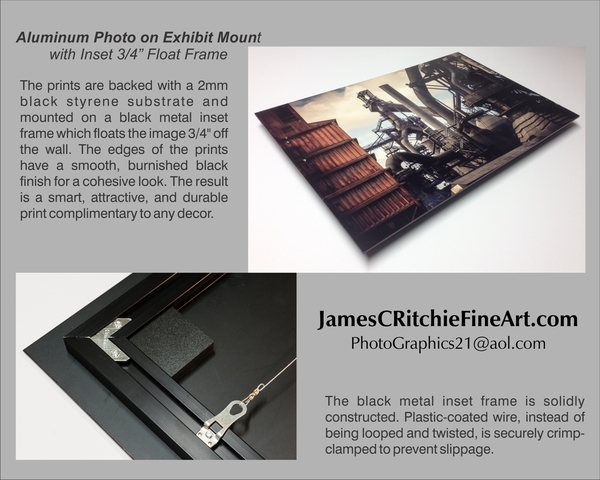 The prints are backed with a 2mm black styrene substrate and mounted on a black metal inset frame which floats the image 3/4" off the wall. The edges of the prints have a smooth, burnished black finish for a cohesive look. The result is a smart, attractive, and durable print complimentary to any decor. These 4"x6" images float 1/2" above a 6"x8" brushed aluminum background and are mounted in a black 6"x8" Plein Air frame. 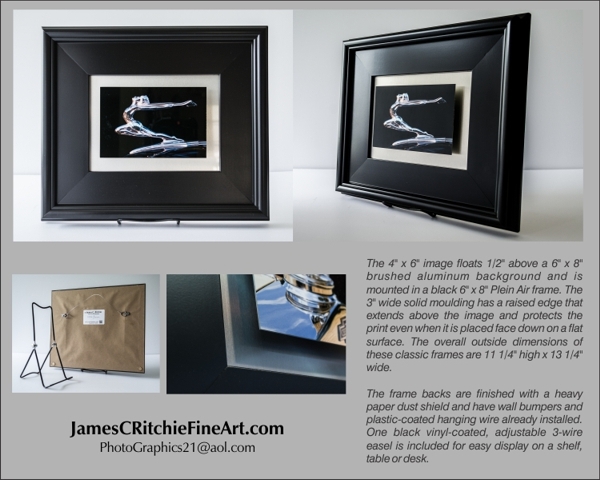 The 3" wide solid moulding has a raised edge that extends above the image so that it protects the print even when it is placed face down on a flat surface. The overall outside dimensions of these classic frames are 11 1/4" high x 13 1/4" wide. The frame backs are finished with a heavy paper dust shield and have wall bumpers and hanging wire already installed. One black vinyl-coated, adjustable 3-wire easel is included for easy display on a shelf, table or desk. Aluminum panels are durable and easily cared for, but they are not indestructible. They are susceptible to dents and scratches like any fine metal finish. Avoid placing them face down or standing them on-edge on hard surfaces, or subjecting them to hard kinetic actions. Should they become smudged or dusty, gently wipe them with a clean, dry soft (microfiber recommended) cloth. For the occasional stubborn smudge, use a clean, microfiber cloth dampened with water or non-ammonia window cleaner. They are fade-resistant, but as with any photograph, direct sunlight should be avoided. Care for the Plein Air frames as with any finished wood.